Last December, the FCC dismantled net neutrality protections for businesses and consumers. The rules prevented internet service providers from blocking certain content, throttling speeds, and prioritizing access to consumers to businesses willing to pay higher fees. Smaller companies stuck in the slow lane would not have a chance to attract new customers or investors. Businesses will be at a competitive disadvantage by having to pay higher fees or accept less efficient service. A fair and open internet is the backbone of our economy. Innovation starts with entrepreneurs. The FCC's net neutrality repeal weakens the best parts of the internet. 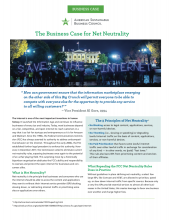 ASBC's new report outlines the potential threats the loss of net neutrality poses to businesses of all sizes and industries. Sign up for ASBC's newsletter and policy action alerts to download. We are business leaders from numerous sectors and companies of all sizes. We serve hundreds of millions of customers in the United States and abroad thanks in part to our access to a free and open internet. We are deeply concerned by the FCC's decision to roll back strong net neutrality rules. All of us rely on open, unencumbered connectivity as a key engine of our business productivity, innovation and growth. We are sure Congress agrees that we should not disrupt and damage the backbone of America’s economy in this way. We'll keep you informed on net neutrality and other sustainable business issues. the restoration of net neutrality protections today. ASBC represents leading responsible businesses like Patagonia, Clif Bar, Etsy, Ben & Jerry's and others stand up for the triple bottom line: people, planet, and profit. Ask Congress to Save Net Neutrality Today. Our businesses depend on it. We'll keep you informed with next steps on how we can win. ASBC leads sustainable policy change and advocacy for over 250,000 companies that believe in the triple bottom line: people, planet, and profit.